Have you ever seen funnyman Jim Carey’s The Number 23? It operates on the same numerological principle. They can’t all be winners. 1. Our new and improved ‘about us’ section. Good words for good people. 2. The Black Road Project. According to some people, the world is ending (or beginning anew) this December. 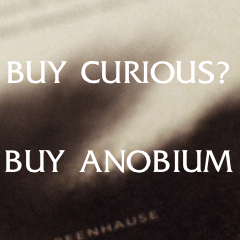 Anobium’s stance on existence is that it is an endless exercise in the arrangement of deck chairs on a sinking ship. The Black Road Project is about this; the end of the world, which is fast approaching. Fact, fiction, and inbred versions thereof. 3. Theater prop-switch breaks the fourth wall. 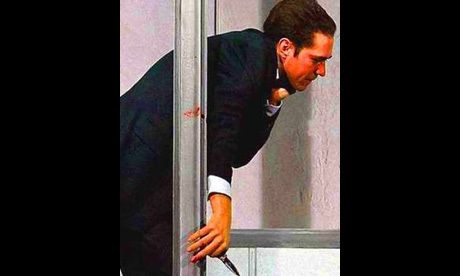 A production of Friedrich Schiller’s Mary Stuart wherein the play concludes with leading man offing himself with a with a knife to his throat. However, in this version, someone swapped a faux knife with bona fide knife (unbeknownst to the actor). Sticky situation. Brechtian, maybe? 5. This report examining the strange thing that compels us to resist the temptation to jump off a bridge. The experience of a sudden urge to jump when in a high place has been speculated to be associated with suicidal ideation; however, scant data has informed this speculation. We termed this experience the high place phenomenon (HPP) and proposed that it stems from a misinterpreted safety signal (i.e., survival instinct). 6. This other report, a bit more dated, proposing that LSD/hallucinogens can be used to treat addiction. Patients were all taking part in alcohol treatment programmes, but some were given a single dose of LSD of between 210 and 800 micrograms. For the group of patients taking LSD, 59% showed reduced levels of alcohol misuse compared with 38% in the other group. 9. Request information on yourself from the FBI via the Freedom of Information Act. Decloset the skeletons you didn’t know you had.